Yesterday I posted my mini rant about how much I hate Sony Music. It was all about threatening Rocky Mountain Bikes and their decade old ‘Slayer’ free ride bike. 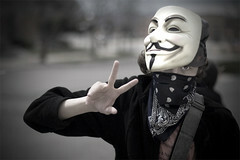 Well, today Anonymous took down the Playstation Network and Sony in retaliation to their attack on some ‘hackers’. It is late. I had a busy day, and I almost forgot to post today, so sorry for the short snippet! I hope Sony is crapping bricks right now! hehehe!